When I took over the Industry 4.0 project earlier this year, I had to go through some sleepless nights. Being a mechanical electronic engineer and working on an IT related topic is like to be in a new country where people speak languages you never heard and follow the culture you never experienced. However, I took the challenge of diving into the new waters of the digital world and found a way to swim through waves of complex IoT topics coming into my way. RAMI 4.0 is one of these challenging topics which I want to explain in a simple way as if to a 5-year-old. Having attended numerous seminars, conferences, council meeting and read various articles on the topic of RAMI 4.0, its meaning and usage is somehow still unclear to me. This is since no one ever tried explaining it in simple terms or by means of a simple example. In the course of digitalizing the industry processes, we forgot the need of educating people on the various topics of I 4.0/IoT. How can we expect the change to happen if the methodologies and impact of change are not clear? Well, I have started my own approach to simplify the complex topics of digitalization and would like to encourage others to contribute to the same. For now, I would like to begin with topic of RAMI 4.0. The processes mentioned on the left (Asset-Business) describes technical as well as the business perspective of your product (in our case: Pizza). Here for instance, asset describes physical components: flour, tomato paste, spices, oven, the recipe and even the baker who bakes it, is an asset. The integration layer deals with easy to process information content and can be considered as a bridge between real and IT world. In our case, it could be a sensor on the top of pizza which tell the baker about its current state (semi baked, baked) as well as other information like temperature, crisp and so on. The communication part is responsible for the standardized communication between integration and information layer. Now image the sensor we mentioned above speaks Italian but the baker can only understand English which in our case is the “standard” worldwide. Here is where communication layers come into play. The information layer as the name suggests holding the necessary data in a structured and integrated form. For us, it is a structured log (date, time, type) of data which we got from our pizza sensor for the last 1000 pizza ordered. The functional layer is responsible for the “action to be taken” based on the information received as well as it is a channel for horizontal integration of various functions. How to avoid over-baking of a pizza? How to reduce the overall baking time? How to coordinate the order-intake, backing and delivery? These questions are addressed. The business layer describes the business model mapping, business processes which can be adjusted based on inputs from the functional layer and legal and framework condition. In our case, it is the description of raw material (floor, tomatoes, cheese, etc.) procurement, pizza baking process, advertisement of the pizzeria, pricing models (buy 2 get 1 free) etc. Well, it was easy to find an analogy describing various layers of RAMI model. But if our pizza shop owner wants to modernize his pizza shop and want to turn into a pizza startup? The aim of this startup is to increase the value proposition by expanding the product portfolio. Yes, I am talking about different kinds or “designer” pizzas. Let’s term it as “pizza prototyping”. This is where we start talking about the “Life cycle value stream” in the RAMI model. So how the above-defined layers are associated with life cycle value stream? 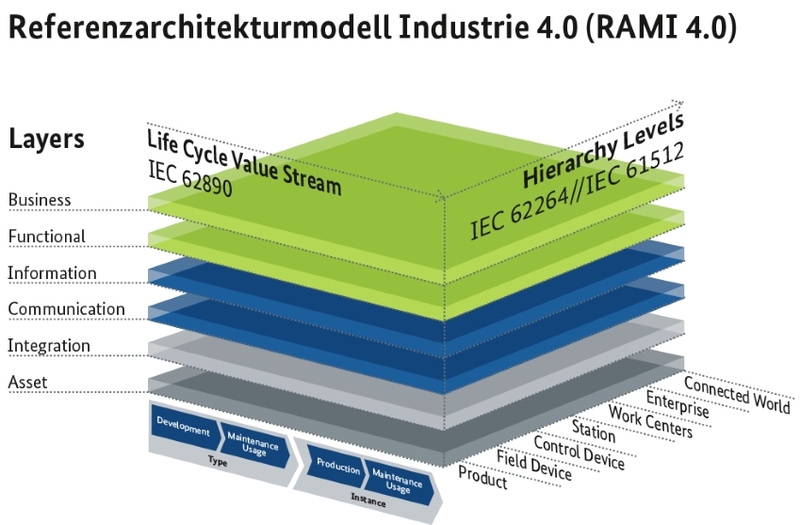 How can one interpret all these layers in relation to the product life cycle? This, I will explain in Part 2: Pizza start up, of this series. Thanks Vivart for this fun blogpost 🙂 Even for me as non-RAMI-expert, I find your approach helpful to understand how RAMI 4.0 works. Now I’m starving for pizza! Thanks for that! You are welcome Mynyna. Stay tuned for the next parts. How to avoid over-baking of a pizza? How to reduce the overall baking time? I personally feel that it is not a part of functional layer. Rather, it is related to Safety & Security Measures (IEC 61508) comprising security of information layer. Functional layer must be act / move / take step in real time. That’s true Mr Khan and as you might have noticed, RAMI 4.0 model says almost nothing about the security. This issue was bought up this year in several IoT conferences, in and around Germany. Cybersecurity experts demanding an introduction of an additional layer in the model. which includes or addresses the safety feature.